Join Perkiomen Tours on our trip to Hanover, Pennsylvania for a tour of one of North America's leading standard bred breeding farms at Hanover Shoe Farms. This exciting trip to Hanover will include a visit to St. Matthews Lutheran Church which will feature an organ recital on one of the 10 largest pipe organs in the world. After enjoying a hot served lunch at Dutch Country Kitchen we will then tour the Hanover Shoe Farms, which is one of North America's leading standard bred breeding farms for three-quarters of a century producing a multitude of winners of harness racing's most prestigious events such as the Hambletonian and Breeders Crown. Star sires have included Super Bowl and Albatross. We will then finish up our day in Hanover with a tour of Warehime-Myers Mansion, built in the early 1900s. 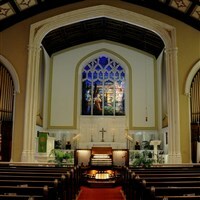 First we will visit St. Matthews Lutheran Church in Hanover for a historic introduction and organ recital which usually features a variety of music including classics, sacred, seasonal, Broadway, Disney and Patriotic music. The Church congregation began in 1743 and the current church building was built in 1924. The church features 10 stained glass windows including one by Tiffany and features one of the 10 largest pipe organs in the world with over 14,500 pipes. You will then enjoy a hot served lunch at the Dutch Country Kitchen specializing in homemade Penn Dutch favorites and good cooking. Before finishing up our trip to Hanover, we will enjoy a tour of the Warehime-Myers Mansion. This mansion was built in the early 1900s by one of the men who owned the Hanover Shoe Factory. This masterpiece of architecture is full of collectibles including a wonderful array of tall case clocks, glassware, porcelain and much more.